The wind and the current were moving in very different directions. I squinted and watched a long line of brilliant green poplars swaying together in the distance, like an enormous emerald centipede inching itself forward. I sat down and leaned against the 70-litre pack strapped to my board, drifting downstream as the breeze caught me. I was turning in a slow pirouette, affording me a panoramic of the Slave River and the vast, quiet beauty of Wood Buffalo National Park’s eastern edge. 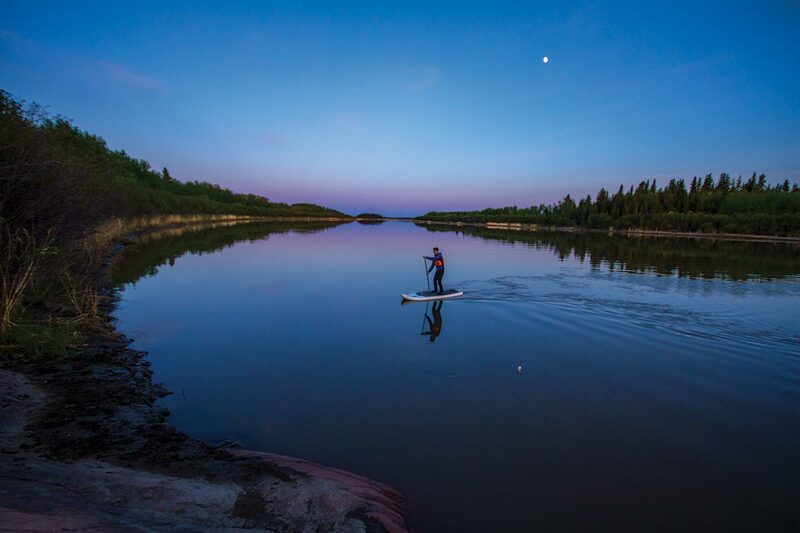 We were four days into a trip that was many months in the planning: a stand-up paddle expedition of the rivers and channels running from Lake Athabasca through Wood Buffalo Park and up to northernmost Alberta. It would be the first time anyone had made this trip by SUP (stand-up paddleboard), and the size and power of the Peace and Slave rivers were a real concern. Wood Buffalo is an enormous and underappreciated national treasure. One of the largest parks in the world and roughly five times the size of Yellowstone, Wood Buffalo is a refuge for wood bison, whooping cranes and other species both endangered and not. The park itself is situated partly in the Peace-Athabasca Delta, among the largest fresh water deltas in the world, and is one of eight Canadian sites granted World Heritage status by UNESCO. So much prep had gone into this expedition that when we finally hit the water all we had to do was paddle and take pictures. Alongside myself (I’m an avid outdoorsman and Outpost’s gear editor), the team was made up of multitasking field guide Delano Lavigne, an experienced climber and paddler who calls Oregon home; Jimmy Martinello, a kinetic climber and photographer from Squamish, B.C. ; and Zachary Zaza, an all-around athlete and water-sports guy from Toronto, and an emerging talent in outdoor videography. Delano leading Team Outpost down the rivers of Wood Buffalo. 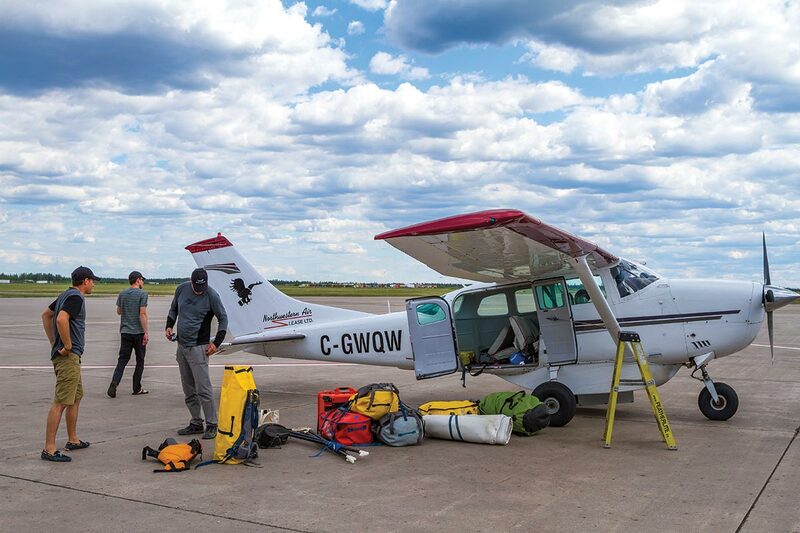 We all flew into Fort McMurray—the gateway to Wood Buffalo, Canada’s largest national park—and the team seemed to gel without effort. Towards the end of the first evening Jimmy said he felt like we had “good juju,” which I understood to mean luck or chemistry. We got to bed after working out the last details, excited about the flight up to Fort Chipewyan, a small hamlet on Lake Athabasca and our jumping-off point for Wood Buffalo. Early the next morning the Cessna climbed into the sky above Fort McMurray and we were flying north, leaving the Clearwater and Athabasca rivers behind. The great boreal forest unfurled under us in a quilt of light and dark greens of poplar and spruce, with countless streams and ponds punctuating the muskeg, and the sun’s rays dancing on the water below us. At Fort Chipewyan we were greeted by Queenie Gray of Parks Canada. Queenie is from Ontario, and has the light in her eyes of someone for whom the outdoors and the North are special places. “I was concerned you might not enjoy it,” she said, in reference to the roughly 145-kilometre stand-up paddle ahead of us. Queenie thought the long distances and often challenging conditions in the park made this less than ideal for SUPing. Still, when we invited her to get an extra board and join us she laughed and her eyes lit up even more. 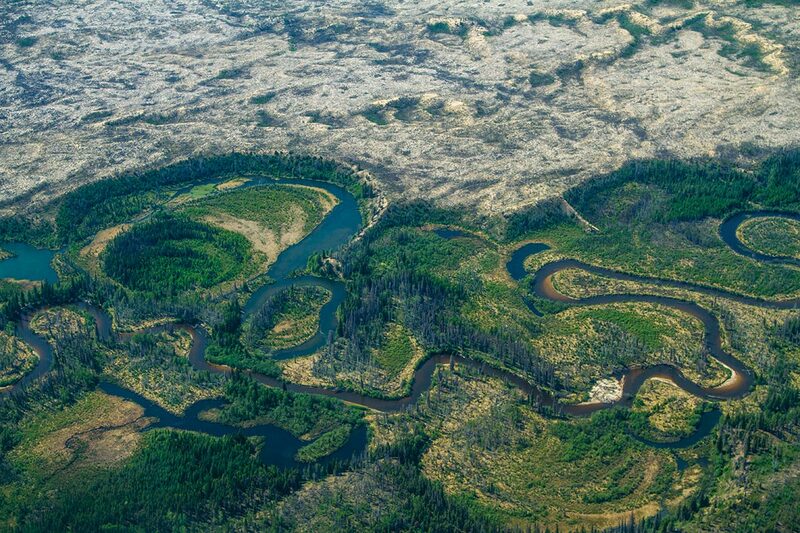 The stunning, snaking waterways of Canada’s biggest national park. We loaded our gear onto the boards and paddled out toward Lake Athabasca through a narrow channel. As soon as we entered the lake we ran into choppy water and whitecaps, and we angled southeast to get the right approach to the river. We paddled hard, and as we turned a corner the noise of the gurgling water subsided and a beautiful river flanked by golden bulrushes and tall grasses with green poplars beyond them opened on the horizon. Above us nine pelicans flew silently in formation, high in the cerulean sky. After a few hours of paddling north we found the channel we were looking for, the Revillon Coupé, marked by a large snag in the river, and turned toward the northwest. The narrow channel would take us up to the Peace River, where we would then turn east back towards the Slave. The Coupé provided shelter from the wind, and we paddled in silence for the most part, mesmerized by the vibrant world all around us: the sounds of geese, the sight of a hawk soaring high overhead, a bank beaver slapping his tail only feet in front of us, or a bald eagle gliding just above the treeline, scanning the shores and the water for prey. 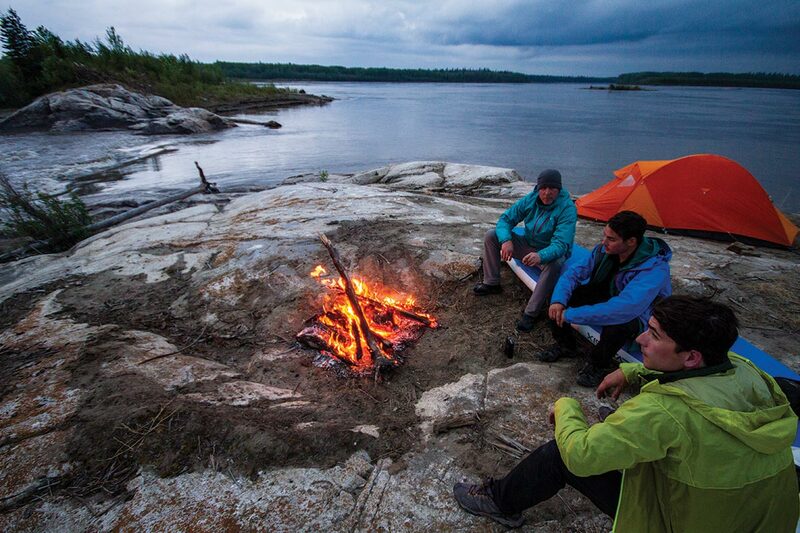 We set up camp on a rock outcropping surrounded by black spruce and the ever-present poplar. As Delano put the finishing touches on dinner we heard the sound of a motor approaching. A few moments later Brian Lepine eased his boat up to the rocks and stepped ashore with a big smile. We had met Brian in Fort Chipewyan and he had offered some really helpful tips on navigation. I don’t think anyone bothered to ask him if he’d ever seen anyone up here on paddleboards: his wide eyes and big smile said it all. But he was definitely rooting for us and was following our progress on Outpost’s website. “You’ve got a long way to go,” he observed, looking up the nearly-still waters of the Coupé. Night falls over the river. Just after breakfast the next day, Jimmy spotted a good-sized black bear on the other side of the channel. He was actually brown in colour and looked to be in great shape. Delano was determined that we eat as much non-dehydrated food as possible, so the smell of eggs and sausages was wafting downwind from our campsite like an invitation. But the bear simply ambled on, a mere 50 metres across the channel, and barely gave us a second look. The paddle up the Coupé was slow going and we were probably averaging only three kilometres an hour—walking speed for someone carrying golf clubs! Of course, we had fully loaded paddleboards, almost no current and a slight headwind to contend with. We were also stopping frequently so Jimmy or Zach could scramble ashore to get shots of the beautiful granite and sandstone outcroppings punctuating the dense spruce stands that otherwise reached right to the water’s edge. The following afternoon the Coupé split into a Y-shape with a large granite rock face in the middle. As we paddled up the right channel the Peace River came into view, one kilometre wide and surging east towards the Slave. Delano looked over and raised his voice above the wind. After a solid paddle to get to the north shore we turned east and rafted up, reclining on our boards and refuelling with CLIF Bars and water spiked with electrolytes. That night was utterly spectacular; we camped on a rocky outcropping in the middle of the Slave River. The weather was definitely changing, and dark clouds were moving in from the west. As we hustled to set up our tents, Jimmy and Zach were scrambling around trying to capture the scenery and the stunning landscape in the shifting light. Team Outpost settles in for the evening. We woke to the sound of wind catching and slapping our tents. By the time breakfast was done the wind was whistling at about 25 kilometres per hour, and we were being whipped by rain showers. We could see the water in the channel just downriver was moving unusually fast, and the wind was definitely coming from the wrong direction. After paddling through some fast moving water right next to our camp, we crossed the channel and headed toward a rocky point where the river turned and headed due north. I looked at Jimmy and Delano out front and could see them digging in, their paddles flexing as they tried to lift their boards and propel them forward, while simultaneously dealing with the crosswind and the waves from their left. The skies were slate grey and streaked with black roiling clouds, and the wind was outduelling the current. We hugged the shoreline and paddled hard, sometimes kneeling on the boards and then popping up to our feet when the wind slackened to try and make some real progress. 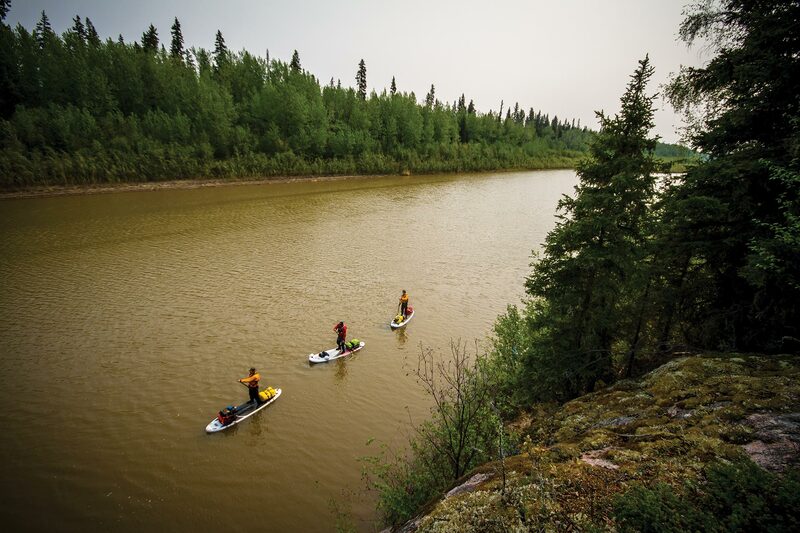 By this time we were deep into Wood Buffalo and were all starting to feel the full force of its wild power and remoteness out there on the water. We paddled hard along the shore, as the wind whistled through the holes bored in the shafts of our paddles. From time to time I heard the sound of a distant flute in the cacophony. We did not see any signs of humanity until we fought our way across the river after a full day of paddling into the wind and set up camp in the tall grass near a trapper’s cabin on the east shore. I remember the bone-deep fatigue and the sense of accomplishment after having wrestled with the Slave River all day. From the north we saw grey skies punctuated here and there by pale blue, and the wind had softened and seemed to be shifting. Soon we could see clear skies to the north and the beginnings of a beautiful sunset, and gazed out across the river at the purple- and orange-streaked sky, grateful for the view and the signs of good weather to come. The sun was already high in the sky as we loaded up the next morning. We still had a long way to paddle—Fort Fitzgerald lay at least another 65 or 70 kilometres to the north. We pushed off in good spirits and the river was a different place than it had been just 18 hours earlier. The current was providing some momentum, and instead of a stiff headwind we felt a gentle cool breeze from the north, carrying the freshness of the Arctic ground over which it would have passed just a few days before. The paddling was definitely easier and the Slave opened up and broadened as we moved north, flanked by dense boreal forest and steep outcroppings of rock. From time to time we would pass an island in the middle of the river, covered only in tall grass and driftwood. On one beach I noticed the root system of a spruce tree, long dead, turned on its side and polished by the wind and the rain, light in colour and looking for all the world like a Henry Moore sculpture. When we reached Hay Camp, on the west side of the river, it was already past dinnertime. But we knew wood bison could be seen near the camp and on the rough road to Fort Fitzgerald, so we unloaded our gear and set out down the road, keeping our voices low and our footsteps quiet. We had walked about a kilometre and were approaching the old Hay Camp, when Zach stopped and raised his left hand. We slowed and quietly rounded the bend, moving like hunters. In an open area to the side of the road, at the edge of a small stand of trees, stood an enormous bull, perhaps a ton or more, and a number of other bison, including a calf. Seeing pictures of wood bison is not the same as seeing the largest land mammal on the continent when you are not at a safe distance and when there are nothing but saplings and tall grass to hide behind. The females and the calf moved behind him and he stared at us out of one eye, perhaps as big as a billiard ball. I did not want to raise my voice, but I wanted very badly for Jimmy not to move closer. It was at that moment Jimmy moved closer. All was quiet except for the wind moving through the grass, the sound of my heart beating and Jimmy’s next step on the sandy road. And then, as if tied together with an invisible string, all of them turned and bolted into the cover of the trees. SUPing can reveal mysteries that otherwise remain hidden. The next day we made the long push for Fort Fitzgerald. The weather was very nearly perfect and the quiet just kept getting deeper and more profound. It had been three days since we last saw or heard a boat. We were alone, deep in Wood Buffalo’s backcountry, and the Slave River was altering us in subtle and not so subtle ways. We talked less yet said more, we looked out for one another, and the common afflictions of modern life seemed to dissolve, anxiousness and impatience among them. We reached Fort Fitzgerald late that evening, after a long and steady paddle that had nearly taken the last of my reserves. We pulled our boards ashore, high-fived and hugged, and then lay in the grass; as much as we were glad to have achieved our goal, I think we all felt like the journey was coming to an end too quickly. None of Fort Fitzgerald’s several dozen inhabitants seemed to notice we were there, but eventually a tall man came by with his dog. Wilfred was friendly and curious, both about us and about our method of transportation, and was a bit surprised that we had paddled all the way from Fort Chipewyan standing up. In the morning Mike Keizer pulled up next to our camp, just off the road, and helped us load our gear for the trip up to Fort Smith. 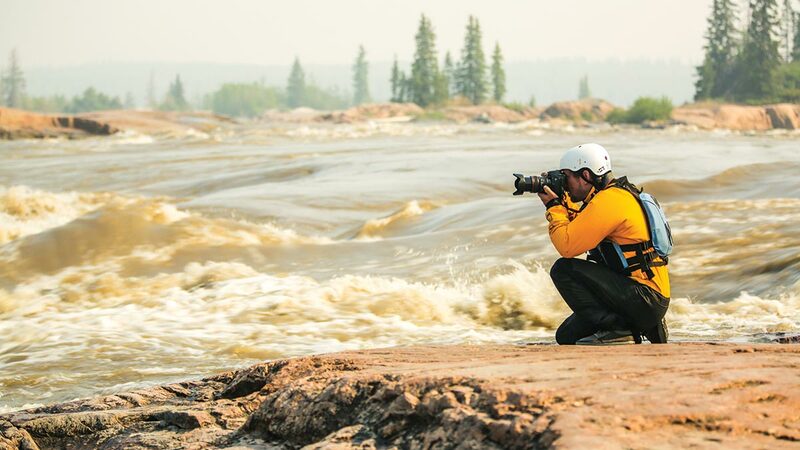 Mike manages communications for Wood Buffalo National Park and was an early and ardent believer that people would come to the Slave River for flat and whitewater paddling. He was almost as happy to have us there as we were to be on the Slave River, and he went above and beyond the call in welcoming us to his neck of the woods and making us feel at home. It was like getting off the river and being welcomed by family, and it made a deep impression on all of us. 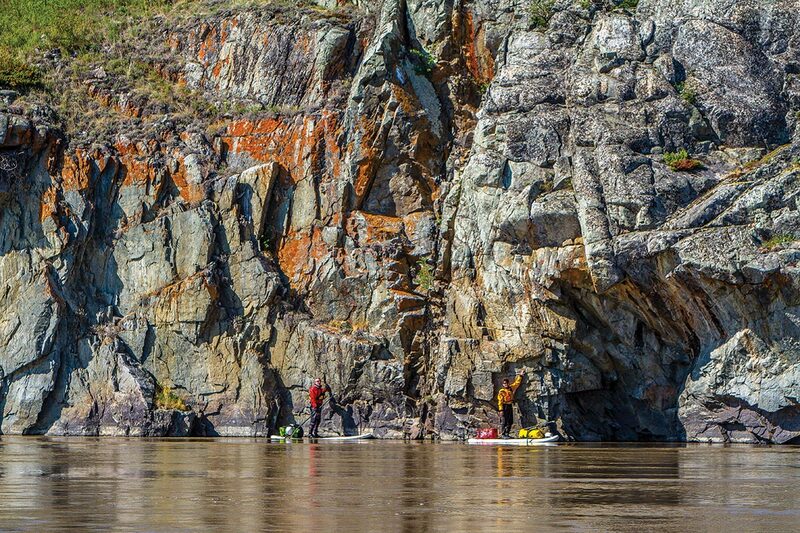 Our steady paddling had earned us an extra half day on the river, and so the next morning the crew headed back into Alberta from Fort Smith and got in a few hours of adrenaline-pumping whitewater SUPing with Ben Ghertner. 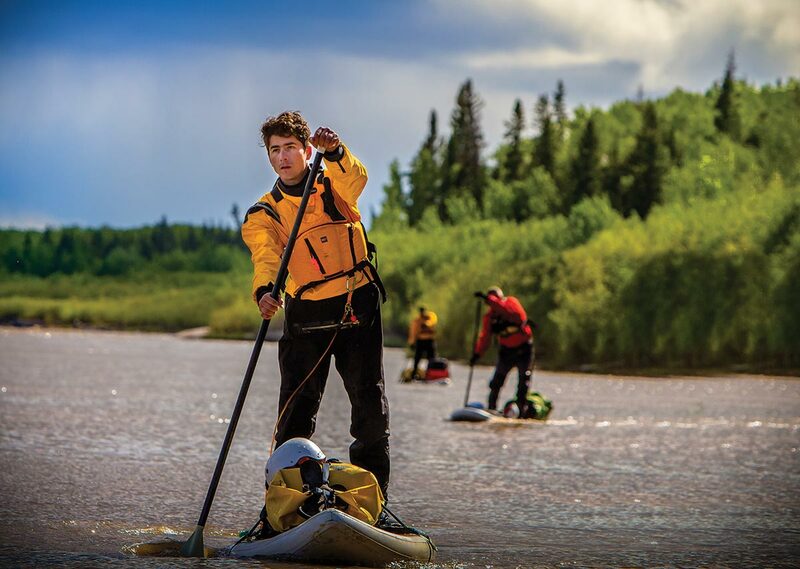 Ben is a 20-year-old native of Tennessee whose appetite for whitewater has drawn him back to the Slave River for the last three years running. I had a vision problem that morning (I just couldn’t see myself in the roaring mayhem of the Slave on a SUP! ), and so I watched from the rocks as Jimmy, Delano and Zach took turns consulting with Ben, then roaring down the river into three-foot rollers and all kinds of swirling chaos, with solid results. We used every minute we could on the river, and our charter with Northwestern Air actually waited for us to arrive for the flight down the river, past Fort Chipewyan and on to Fort McMurray. The plane climbed skyward and turned south. We flew as low as regulations would allow, and the sparkling river stretched out before us, winding through boreal plains and forests and past enormous sand dunes and salt flats. The journey from Lake Athabasca to Alberta’s northernmost border had left us drop-dead tired, but we were no longer strangers to this remote world and that was something to be proud of. None of us can say when we might find our way back to Wood Buffalo, but the experience will stay with us no matter how long that might be. This article originally appeared in Outpost Magazine, summer 2015. Paul is Outpost's gear editor and a senior writer. A seasoned expeditioner, he often writes features long and short for Outpost Magazine.